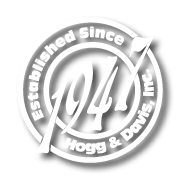 The Hogg and Davis, Inc. Model TH40 means versatility. Fast becoming the industry standard workhorse, the TH40 combines the most sought after features into a smooth operating, long lasting, compact unit. The key to this unit’s popularity is hydraulics. The hydraulic mandrel lifts and idler wheel allows one man to load or unload reels without delaying other pieces of valuable equipment. Gone is the necessity of boom trucks standing by. Gone is the need for three or four men to wrestle heavy reels. The TH40 pays for itself in manpower savings alone. 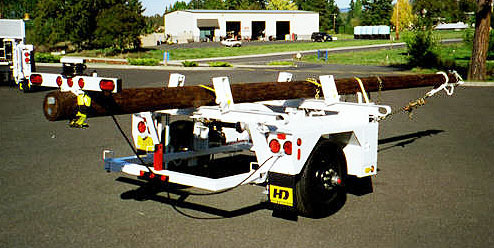 The TH40 is built to meet the requirements of any utility engaged in-strand and cable transporting and stringing, or pole and material handling; designed for the most demanding. Idler Wheel: Bearing mounted idler wheel affords easy maneuverability of unit. 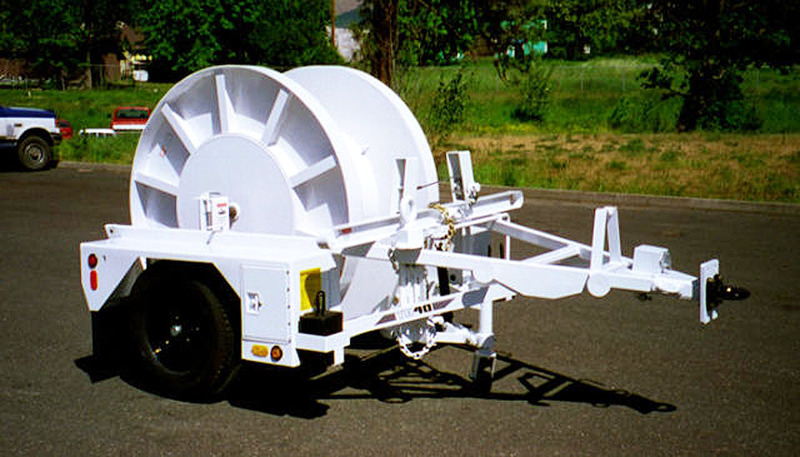 Hydraulically actuated, this idler wheel elevates the tongue of a fully loaded trailer to proper level for hook-up to truck. 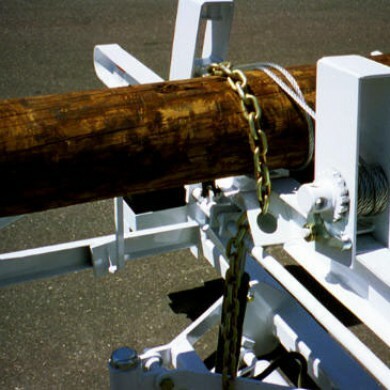 Bolster Chocks: Ruggedly constructed self-locking bolster chocks with built-in winch provide maximum binding power for loaded poles. 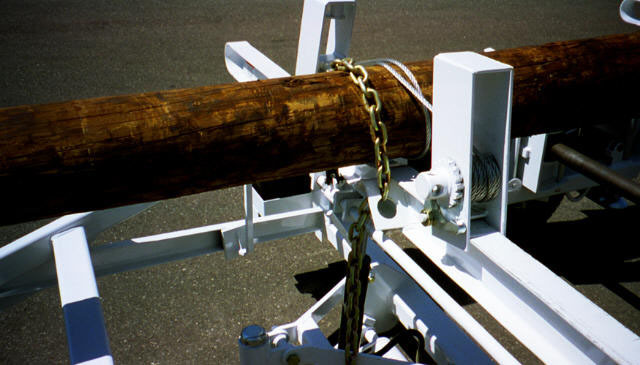 Each winch chock is equipped with fifteen (15) feet of 3/8″ high tensile strength wire ropes. 3-stage Pump: Specially constructed three-stage pump is conveniently located to control all hydraulic functions from a single position. 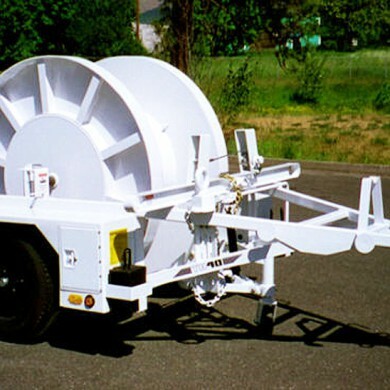 Special handle and arrangement of pumps allow reel cylinders to lift simultaneously eliminating the problem of reels becoming cocked in the trailer. 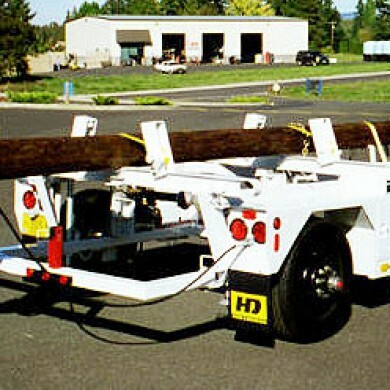 Safety Stand: Quick release safety stands provide extra stability and support for paying off or pulling wire over rear of trailer. Spring loaded latch insures positive locking in the down position. 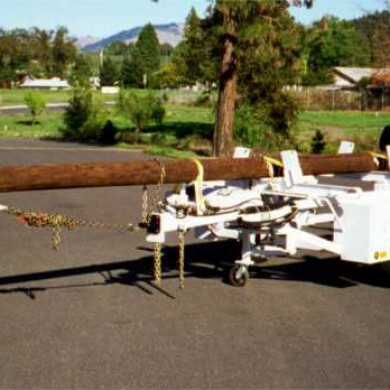 Cadmium-plated safety stands resist the effects of weather to remain smooth working at all times.